Thuya wood veneered on oak, the central column gilded and painted to imitate patinated bronze, the three ancillary supports of patinated bronze and gilt brass, the framing mount to the top also of gilt brass. This oak table--veneered with thuya wood and edged in gilt brass--is marked on the underside of the top with several stencilled inventory numbers and the stamped mark of the Château de Saint Cloud. It was made for the Château in about 1802, during the period when Napoleon ruled France as First Consul. Even before he became Emperor of France in 1804, he set in motion grand schemes of refurbishment for the royal palaces, including Saint-Cloud. His patronage was extremely important to the cabinet-makers and upholsterers and re-established the market for luxury goods in Paris after the Revolutionary years. This table was recorded in a watercolour of the Salon des Officiers de Service at Saint Cloud in 1863, at a time when Napoleon's nephew, Napoleon III was ruling France. Circular centre table of oak, veneered with thuya wood on the top and an unidentified burr on the base, the top with three lines of ebony stringing, outlining a circle in the centre and defining the edge of the table. The top is edged in gilt brass and top supported on a central shaft in the form of a palm stem, with applied decoration in composition, painted and gilded. 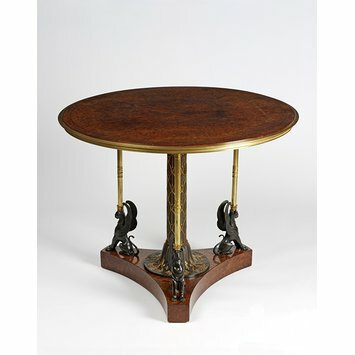 It rises from a triangular base with concave sides, veneered in an unidentified burr wood; the outer points of the base are set with winged panthers in patinated bronze, bearing lacquered brass staffs on their heads, supporting the outer edges of the table. The table top is built with a central hexagonal core, surrounded by six shaped cleat panel, presumably attached with tongue and grove joints. The underside of the top is counter-veneered with oak, to balance the effect of the thuya veneers on the top surface, and both show tearing at the joints of the boards. Under the edge of the top is a lipping piece of oak, the curves cut from the solid, in sections of variable length. The gilt-brass edge mount is a particularly fine casting, made in section approximately 42 cm long, brazed together. The central support is in oak, with applied decoration in composition, painted and gilded. The outer shafts of lacquered brass, rising from the heads of the leopards, are screwed into wooden blocks at the top. Roman capitals; Underside of top; Stamped. This table is attributed to the cabinet-maker Adam Weisweiler (1744-1820), with mounts probably by the bronze-maker, Pierre-Philippe Thomire (1751-1843). It was probably commissioned by the dealer in luxury goods (marchand-mercier) Martin-Éloi Lignereux (1750-1809) for the re-furnishing of the Palais de Saint-Cloud for Napoleon. In 1805 it was in the salon of the Emperor in the cour d'honneur. The design relates to a drawing by the designer Charles Percier (1764-1838) for a table with mosaic top intended for the Elysée Palace in Paris It shows a similar table, but with a heavier central shaft, of double-baluster form. This drawing is illustrated in Hector Lefuel, François-Honoré-Georges-Jacob-Desmalter, Paris, Editions Albert Morancé, 1925, pl. XXII). On that drawing, the lions or leopards are sitting back on their haunches rather than sitting up, as here. The table appears to be the one shown later in the centre of the Salon des Officiers de service in a watercolour by Jean-Baptiste Fortuné de Fournier (1798-1864), painted in 1863 and now in the collections of the Château de Compiègne (inv. no. C.72D.7). This room served as the private sitting-room of Napoleon III and a version of the watercolour, showing the Emperor sitting at the writing table to the right was published by Mario Praz, 'An Illustrated History of Interior Decoration, from Pompeii to Art Nouveau' (London, Thames & Hudson, 1964, p. 355, fig. 358. This watercolour was with the dealer Fabius Frères at the time of publication. Miss Sanderson Stewart, who gave the table to the Museum in 1939, wrote in the acquisiton papers (RP 39/823): 'My father bought it in Versailles in I think 1877 from an old dealer who had it straight from the fire at St. Cloud. At the same time Father bought some quite good Louis XVI pieces which I also have'. (Nominal File: Miss A. Sanderson Stewart). A photograph of it shows it in Miss Sanderson Stewart's house in Malvern. A circular table on a central support, with three supplementary supports rising from a base of triangular form with concave sides. The top and base are veneered in thuya, inlaid with ebony stringing close to the edge and with two lines of ebony stringing outlining the centre of the table. The top is edged with a gilt-brass mount. The central column is carved with lotus leaves, the base with a spreading, bell-shaped collar carved with lotus leaves and anthemion, the whole painted a bronze-green colour, with the raised details gilded, the whole intended to look like patinated bronze. The three ends of the base each support a figue of a winged panther in patinated bronze, sitting back on its hind quarters. Rising from their heads are three slender gilt-brass columns or rods, supporting the table top, with cast lotus leaf collars at the base and the mid-point of each column. Said to be illustrated in Léon Groër. Decorative Arts in Europe 1790-1850. New York , Rizzoli, 1986 (page ref. to be checked). Samoyault, Jean-Pierre. Mobilier Français Consulat et Empire. Paris, Éditions Gourcuff Gradenigo, 2009, p. 117, fig. 199. Stencilled inventory marks underneath the top show that this table comes from the Château de Saint Cloud, one of Napoleon’s main residences. On becoming First Consul in 1799, he embarked on a grand scheme to refurbish the former royal palaces and revive the market for French luxury goods. 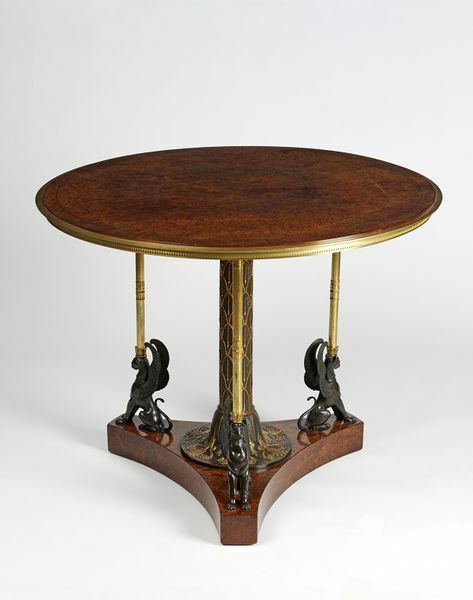 This table was possibly commissioned by the marchand-mercier Martin-Eloi Lignereux (1750-1809) and supplied for the re-furbishment of the Chateau de Saint-Cloud for the Emperor Napoleon.